KEEPER OF THE SNAILS: More Reading for China. The Michel Thomas course concentrates exclusively on the spoken language of Mandarin, which is the official language of China. However, for many people this is not their first language. For instance, in Shanghai they speak Shanghaiese. I am not sure how different these languages are from each other (or indeed if they are more correctly classified as dialects), but one thing that links them all is the written word. I remember reading about this a couple of years ago, when I went to the First Emperor exhibition in the British Museum in London. More than 2000 years ago Chinese writing was standardised and, since then, it has been understood throughout this vast empire. So, since I shall be travelling around China on my own, and there are likely to be no handy signs in English (or even, perhaps the Roman-letter version of Mandarin, Pinyin), I thought I'd better attempt to learn a little written Chinese. I think I may have left it a little late - but this book Learning Chinese Characters will give me a good start, I hope. 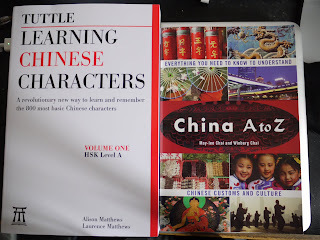 My other essential reading is China A to Z: Chinese Customs and Culture. I'm planning to read a little everyday. So...I have to read the Illustrated History, the culture guide and at the same time learn a few written and spoken words each day. I have a lot to do before I set off and have only three weeks to go now. Gulp. On a whim I tried to teach myself Mandarin when I was 19. I simply couldn't get into the mindset. I could remember a few characters and understand how they were structured but structuring a sentence was so much harder than French or Latin not that I went very far with either of them either. You've got your work cut out. I'm sure you're right, Jim. Ah well, all I can do is have a go. Your predicament reminds me of having to cram for a test. Good luck to you! Yes, feels a bit like that, Mary! I'm planning trips(s) to northern China next year and I'd love to learn enough Mandarin to say 'please' and 'thank you'. I salute your efforts, I really do. Ooh to visit the dinosaur sites, I presume, Cromercrox - how exciting! Thank you for your kind comment - much appreciated!